Once you have decided to purchase an investment property, you must then decide whether or not to use a professional property management company. Here are a few things to consider before you decide to do it on your own and which company to go with. A professional property management company will set up your home and take care of all of the utilities. There is a lot to do when getting home ready for clients. A property management company is very familiar with all that this entails, not only with utilities but also with furniture and other necessities. 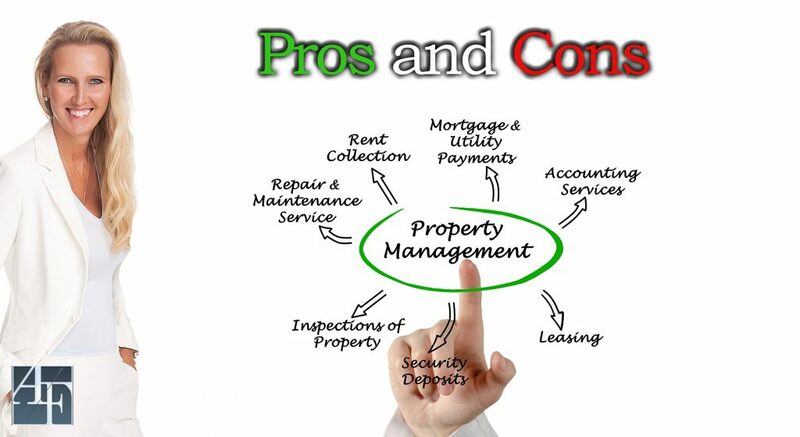 A professional property management company will ensure that all legalities are taken care of. When you are preparing a home to receive clients, you need more than furniture and utilities. You also must have the necessary licenses, taxes and other legalities covered. Using a professional property management company will ensure these are covered. Professional management companies have the staff to deal with emergencies at any hour of the day or night. When clients are in a home, anything can happen at any hour of the day or night. Using a property management company means that they will be taking care of those late night p;hone calls and emergencies. You can choose a professional management company that will book your home and bring in revenue. Finding clients and keeping your home booked is difficult. A professional management company will be able to market your home and work with other agents to keep your home booked. This will ensure a constant source of revenue. Using a professional management company, you can be sure that your home is kept at a high standard. There are extra costs if you choose to go with a professional management company. Of course with any service, there are fees and a management company is no different. You will have monthly charges on top of your regular house costs. Are they trustworthy? Be sure to thoroughly check out any management company you may choose. There are good and bad in any industry and property management is no different. Read reviews and speak with current clients if possible. A professional property management company may be impersonal with your guests. Any time you use a company as opposed to an individual, you loose some of your own personal touches. Whether or not you choose to use a professional property management company to take care of your investment property is a big decision. If you would like to discuss these points -or have other concerns, I’d be happy to assist you. Email me An@OrlandoVacationRealty.com or give me a call (001) 800-0888. Be sure you have a basic knowledge of the area you are investing in. Surround yourself with experts and utilize their knowledge. Work with a Real Estate Broker in the area you are interested in. Budget and finances – Know what your budget is and what to expect as a return. 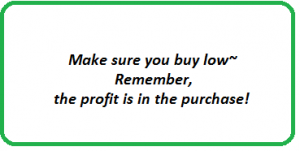 Compare benefits of buying cash, mortgage, equity etc. Keep your running costs low. Research management services, know the benefits. Talk to a CPA or attorney about the benefits of setting up an LLC to protect your assets. Request a market analysis (CMA) of any property you are interested in before making an offer. Choose an experienced and licensed Real Estate agent. As the buyer, you do not pay for this service. I highly recommend this so you have someone representing you that has your best interest at heart. They will have the knowledge and expertise you need for the local real estate market. Open a US bank account. This is very important and should be done as soon as possible. If you are a UK investor and are interested in the Central Florida Real Estate Market, email me An@OrlanodVacationRealty.com or give me a call (001) 800-0888. Is the community gated? Let’s face it, for the consumer this is very desirable. When families travel, they come across many unknowns that can cause them to feel uncomfortable. Whether they are travelling to a country or region unfamiliar to them or travelling to an area that speaks a different language. The security of a gated community to many renting a vacation property is often their number one requirement. Location: distance to main attractions, restaurants, shopping. Location Location Location. There are many things you can change about a property, but location isn’t one of them. Be sure that you purchase your short term rental investment property in a community that is close to all that the area offers. Pool location. Firstly, in a short term rental investment property a pool is a must. Be sure that the pool is South facing – as this receives the most sun. Many vacationers like swimming in the early morning or the later hours and having a South facing pool is very important to them. This could be the difference in someone choosing to rent your home over someone elses. Home amenities and furnishings. To truly offer a ‘home away from home’, you must be sure that you have exquisite furnishings and upgraded appliances. You never have a second chance to make a first impression. If a potential client is viewing your property in consideration of renting it, the appearance of worn out drabby furnishings could turn them away. HOA and CDD costs. Now this tip is very important. Your HOA (home owners association) and CDD (community development district) fees are additional to your normal monthly operating costs. These fees can vary drastically depending on the community and location. Be sure that you completely understand what these fees are before buying your short term rental or investment property in Florida. If you are interested in investing in a short term rental property in Central Florida, email me at An@OrlandoVacationRealty.com or give me a call (001) 800-0888. 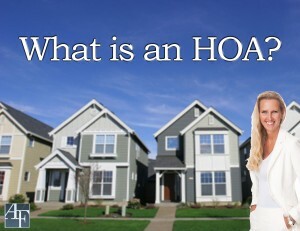 What is an HOA? What are the Benefits and Down falls of an HOA? First, let’s start with what is an HOA? Then we will discuss the benefits and down falls. An HOA, or Home Owners Association, are legal entities that govern a community and help to maintain and manage common areas. There is usually an elected Board of Directors that consists of volunteer home owners in the community. Annual dues are required from all home owners that live in the community and are used for various necessities such as upkeep of common areas like community pools, parks and landscape and also insurance to protect home owners form any liability from those using these facilities. There are both benefits and down falls to living in a community with an HOA. What are some of the benefits to living in a community with an HOA? Your community is regulated. Your neighbor can’t just paint his home purple with yellow polka dots, or grow a jungle. These actions would deflate the value of your home. and the value of your home will not be deflated. What are some of the down falls to living in a community with an HOA? Definitely the cost. HOA fees can range from hundreds of dollars a year to hundreds of dollars a month – and everything in between. Be sure you understand the HOA financial requirements of any community you may be interested in. A highly regimented HOA may be suffocating. Constantly receiving warnings regarding such issues as your trash bin being left out too long, or someone not approving of how you parked or the number of guests you had at your home can be extremely annoying. There are usually benefits and down falls in all communities, especially those with an HOA. What is important is to buy a home in a stable community with a secure, low cost and friendly HOA. If you have any questions regarding communities in the Central Florida area email me An@OrlandoVacationRealty.com or call me (001)800-0888. 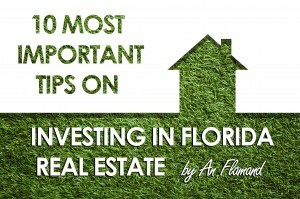 8 things to think about when buying your first Florida rental property. If you are considering investing, here are 8 things to think about when buying your first Florida rental property. Central Florida’s economy is booming, the tourism industry breaking attendance records, and new homes being built every month, there might not be a better time for a foreign investor to start thinking about the value of purchasing one of those pre-construction homes in the Orlando area. If you are considering buying a Florida rental property, there are certain things for you to think about. That purchase could turn out to be the smartest investment they ever made. Florida remains one of the fastest growing states in the U.S., and the housing market continues to thrive. But before starting a search for just the right property, smart investors should first seek out the guidance of a Realtor who knows the Central Florida market, and can help them make the best choice, noted An Flamand, the owner and broker at Orlando Vacation Realty. An, who specializes in marketing pre-construction homes and investment properties in Central Florida to foreign investors, noted that before starting their search, buyers should first consider eight things to think about when buying your first Florida rental property. Doing so will enable them to maximize their potential for the best investment possible. So these are the most important questions to ask y ourself. 1) Who can help me with the purchase of my home, and will this cost me money to be represented by a Real Estate agent? As An noted, Real Estate Agents are paid by the sellers, so there is really no good reason not to be represented by an expert in the field. The expertise a licensed real estate professional brings should give buyers more protection and security and could as well save them thousands of dollars. Experienced Realtors, An noted, will be able to guide the buyer to the exact kind of property they want — from a single family home with the potential to be rented out long-term or as a vacation home, a condominium or a townhouse, for example — in the most desirable location. Experienced Realtors can also assist the buyers with a CPA or local attorney when needing further assistance when investing in Florida. Orlando Real Estate specialist An Flamand stated that a good REALTOR will assist his/her clients from the beginning till the end. 2) What is the best use of the investment property: short or long term rental? There are advantages to making your new property available as either a long term or short term rental. The Orlando area alone has been attracting nearly 1,000 new residents each week, many of them looking for a home to rent. Vacancies in desirable locations are often low, making your new property a sure bet to attract quality tenants. It’s also worth noting, however, that Central Florida with its theme parks and other attractions remains one of the most vibrant vacation home markets in the state. These are fully furnished houses that are rented on a short term basis to tourists, business travelers, and others looking to spend their time in this region in a house rather than a hotel room. Vacation homes are particularly appealing to families looking for the amenities they offer: a kitchen, multiple bedrooms, a game room for the kids and a private pool, for example. Some vacation homes remain booked months in advance if they are close to the theme parks. Both market are really good at this time, however if you are thinking of utilizing the home for your own stays or vacations, then short term rental is definitely the way to go. If you do not have any intentions in doing this, then long term might be the better way to go. The bottom line is this: long term residential (lease) rental, has a bit more steady secure income, short term, van be great one month slow another. I always compare it to the stock market, short term has more potential of more profit however a higher risk, long term steady secure income lower risk. In Central Florida, the key to location is often summed up in two words: theme parks. Many of the most desirable vacation homes and long-term rental properties as well are in Osceola, Lake and Polk county, which are both a short drive to Walt Disney World, Universal Studios and SeaWorld Orlando. This enables tourists staying in vacation homes to easily access the parks they came here to visit; and for many tenants looking for a long-term rentals, many of the jobs they came here for are also at the theme parks or in the tourism areas. 4) Should I pay in cash, or obtain a loan abroad? Do I have the deposit? Experienced Realtors, An noted, can guide a buyer through the pros and cons of paying for their property in cash, knowing how much to put down as a deposit, and if needed, securing a mortgage through a U.S. financial institution. The Realtor, An noted, can walk the buyer through every step of this often complex process. 5) Who will manage my home? Can they provide me with the return I need or want? Just as Central Florida has a thriving vacation home and rental market, there are also plenty of property management firms in the region that can take on the routine tasks of maintaining a property owned by a foreign investor from finding the tenants (and doing the necessary background checks) to collecting the rent, to maintaining the property, paying property taxes on time and ensuring the property meets all local codes. It is however that the management company is a licensed and insured business, has an office and has the marketing funds to promote your home. Orlando estate agent An Flamand states that very often we see that sellers/ owners are renting out their home and don’t even have a license, they have never paid the sales taxes as they were never informed they should by their management company. This will cause a problem when selling and let’s not even talk liability. Important to remember is, look for a professional company who is licensed and insured and offers the services you need and would expect from a business. 6) Price, what can I get for the money I have, and does it include furniture? Vacation homes are often sold furnished as An noted, however a Realtor can assist a buyer to find the right furniture experts in Central Florida incase needed. Prices across Central Florida vary, depending on location. Realtors can match the buyer to a property in a desirable location that is also within their price range. Make sure to pay for the value of the home however if you are buying a home and are obtaining a mortgage, the home will automatically be appraised. If the home is sold above market value the buyer will have a problem obtaining a loan. The easiest way, which will avoid later disappointments, is to find out what the property value is, ask your REALTOR or Real Estate Agent to prepare a CMA (Comparative Market Analysis) for you on the home. This should give you a rough idea that what you are planning on buying the home for is actually the value of that home. 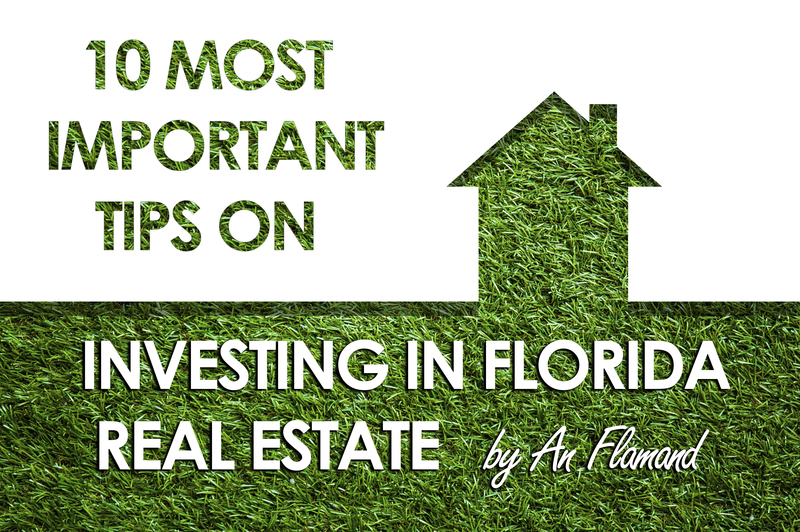 While there are many things to consider when you are planning to invest in Florida Real Estate, I consider these tips the most important. ~ Real Estate investing is a business, treat it as such and do not get emotionally involved. ~ ALWAYS use a local specialized licensed Real Estate Broker or Agent, preferably one specialized in investment real estate. There is NO cost to the buyer to be represented by a Licensed Real Estate Broker, so why not have free representation. Real Estate agents and Brokers, in the state of Florida, are licensed – unlike other countries where anyone can become an agent. They are also obligated under Florida regulations to continue their education on a consistent basis to keep them up to date on new rules and regulations. ~ Have funds ready – ideally cash – as this gives you the extra leverage at the time of buying. ~ Always have a CMA (Comparable Market Analysis) done by your REALTOR. ~ Make sure to always have a long term plan in real estate…it is safe to look at real estate as a long term plan, even though you may want to sell fast and you may be able to make a fast profit. It is always smart to look at it long term a real estate will always make money over time. ~ Diversify. Buy some property to keep long term (look for good ROI), buy something short term, buy in different areas and different price category. ~ Ask for a pre-HUD or closing statement so you know what the costs will. Calculate what exactly costs will be at buying, costs or repairs and you cost for selling. You will have to calculate some margin for worst case scenario and then add your profit margin. Is this still a price you can sell this home for? It is vital to take everything into account. However, you may want to rent out the home for 2 years and also count on the extra appreciation. Ask your Real Estate agent what the market appreciation prognosis is. ~ Pay for an inspection! Have an inspection done. It is worth the money and good to know in advance. Any repairs needed may still be negotiable during the buying process. ~ Take out a home warranty if you are planning of keeping the home for a year or more. ~ Set up an ‘LLC’ by a licensed CPA to buy our investment Real estate in Florida, USA. This will help you with expenses, inheritance rights and any liability problems if the would ever occur. ORLANDO — Here is why the UK housing market is boosting investment sales in Orlando. Prospective home buyers in the United Kingdom are facing two separate headwinds, one that continues to make the move toward purchasing a home look more attractive – and several others that could toss icy cold water in their faces. Last week, figures released in the UK indicated that the number of first-time home buyers stood at 21,000, a 6 percent increase from 2015. More buyers are getting in because of mortgage rates, which are at historic lows in the UK. The Monetary Policy Committee just voted to keep the UK Bank rate at 0.5pc for an 84th consecutive month, which continues to provide first-time buyers with the opportunity to take advantage of these record low rates. In fact, those mortgage rates are not only proving to be appealing to first time home buyers, but also to those looking to remortgage their property. At the same time, the market is facing some new headwinds from SDLT — the new 3 percent stamp duty land tax levy that went into effect on April 1. It was announced last year by Chancellor George Osborne, and will impact domestic and foreign buyers of second residential homes in the UK over £40,000. There are exemptions for caravans, mobile homes and houseboats, and no charge on inherited properties. The SDLT is not the only challenge confronting buyers. The real estate market across the United Kingdom is facing two critical factors: a limited supply of homes, and, with it, rising prices. In fact, a new report shows that the ratio between the average city home price in the UK and average gross earnings has hit its worst level in eight years. Lloyds Bank’s Affordable Cities Review showed that the city of Exeter, for example, was the tenth least affordable market in the UK, with average house prices 8.36 times higher than average local earnings. But it wasn’t an exception to the rule: the average UK city house price shot up by 8 eight percent in the past year. The SDLT was actually introduced to address this problem, since the British government was hoping that the increasingly expensive buy-to-let market could be cooled off a bit with the imposition of this new tax. The government’s hope was that it could slow price hikes and make it easier for first-time buyers. Starting this month, anyone who buys a buy-to-let investment, second home or holiday home in England, Wales or Northern Ireland, will pay the additional 3 percent SDLT on top of the standard rate charge based on the value of the property. All of this is playing out in the weeks leading up to a referendum in England, asking voters to decide if they want to remain in the European Union. The issue has added a lot of uncertainty to the real estate market, since it’s not clear how a yes vote would impact Britain’s business relations with the rest of Europe. These factors could also produce another result: to encourage more European investors to look beyond the shores of England and the rest of Europe to a potentially more stable option in the United States. The continued growth in the U.S. economy has helped improve the real estate market, particularly in fast-growing states like Florida, and made the notion of foreign investment here that much more appealing. Last week, the federal government reported that 215,000 jobs were created in the United States in March, exceeding economists’ expectations of 210,000 jobs. The nation’s unemployment rate was 5 percent, and there were indications that a rising number of previously unemployed Americans were getting back into the job market. Florida’s unemployment rate is even lower at 4.9 percent, and Central Florida’s housing market is growing quickly, with sales up from a year ago. It’s not uncommon, An Flamand noted, for British investors to get advice about the real estate market in the United States, and even about how the purchase of a home there can help them secure permanent residency. There’s just one problem, noted An, Owner/Broker of Orlando Vacation Realty. 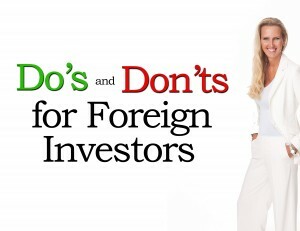 The advice isn’t coming from someone like An herself, a Real Estate Expert who specializes in foreign investment purchases. It often comes from attorney solicitors with a fundamental misunderstanding of how the U.S. real estate market works – particularly for foreign investors. “They will tell them that if they own and manage two or three homes here, they can become citizens,” An noted. But often times those buyers have found out, the hard way that their investment didn’t quite work out that way. “After three years,” An noted, “they have to go back to England for their E2 visa.” And that’s when they find out that in addition to owning the properties, they also needed to create jobs in the community, demonstrate growth in their investment, and prove other economic factors. For many, not being able to demonstrate that means they are suddenly packing their bags, forced to return to the United Kingdom. What they really need, she added, is the expertise of someone who fully understands the market, particularly as it applies to investors. To assist buyers, Orlando Vacation Realty just released a new advisory report for investment buyers, on knowing what to avoid once they’ve made a decision to purchase an investment property. Having an expert in the real estate market guide them, An said, will make all the difference between a highly successful investment – and a potentially risky one. The advisory report notes that the top three things to keep in mind when investing in real estate are, first, to avoid the kinds of “get rich quick” schemes that are sadly all too often pitched at investors. As An noted, if a deal sounds too good to be true, the chances are it definitely is. This is particularly true for small investors, she said. “The large investors are more experienced,” she said. “But the ones who buy two to three properties, it’s those kinds of small investors who sometimes go with people who don’t really know the market.” And it’s those agents, she added, who frequently attempt to mask their lack of knowledge and experience with those all-too-familiar get rich quick schemes. “They hear from them, ‘If you do this and that, you’ll make this much money’ – but it doesn’t happen,” An said. That’s why all investors should specifically look for an Investment Real Estate Broker like An Flamand, someone who is specializes in the investment market. They have a much greater opportunity there than with a real estate agent that primarily sells to residential clients, but who are not specifically trained to assist investors. Lastly, look for the Real Estate Investment Broker that wants to help you find the best possible investment – and not simply a purchase that amounts to the best sale for the Realtor. Look for a broker, An said, that wants to establish a long term relationship with the investor. The ones that do, she added, will be the ones that buyers can most solidly rely on. An noted, she has spent years guiding foreign investors to appealing properties in Central Florida’s fast-growing housing market. ORLANDO – Townhouse sales are going up. Throughout the Orlando area, home prices are rising, while buyers are finding fewer homes available to pick from, according to a new report by the Orlando Regional Realtors Association. In fact, the inventory of homes available in the region took “a tumble” last month, the association noted, leading in some areas to a double digit increase in the median price, which last month was $185,000. That’s a 12 percent rise compared to February 2015, when the median price was $164,900. Last month’s median price is also up 2.78 percent compared to January 2016, when it was $180,000. “The Orlando median home price has now experienced year-over-year increases for the past 55 consecutive months,” the association noted in the report, while adding that in February, the median price was 60.17 percent higher than it was seven months ago, in July 2015. February’s median price was also the highest since August 2008, when the price was $200,000. The rise in home prices reflects an increase in sales as well. ORRA members participated in the sale of 2,334 homes that closed in February. That was actually a decrease of 5 percent compared to February 2015, although it also marked an 8.76 percent increase from January 2016. John Lazenby, the president of ORRA, said he’s hopeful that the increase in prices will encourage more area homeowners to put their house on the market. “Our hope for easing the inventory shortage is that more sellers will evaluate the favorable conditions and decide to place their homes on the market before the traditional spring/summer home buying season starts in earnest,” Lazenby noted in the report. Another aspect of the housing market in February was the strength of townhomes, which sold at a much faster pace than single-family houses, ORRA noted. The sales of duplexes, townhomes, and villas shot up by 9.91 percent last month compared to February 2015, even as single family home sales fell by 4.7 percent. ORRA noted that townhouses have become an appealing – and affordable – option for many home buyers in this market. 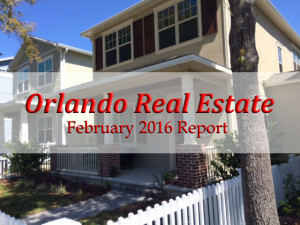 Orlando home buyers purchased 244 duplexes, town homes, and villas last month. An Flamand Orlando Real Estate Broker, with Orlando Vacation Realty agrees that the town homes have definitely been the preferred choice for many real estate buyers & investors. Buyers may also have been drawn into the market by low interest rates. ORRA noted that the average interest rate paid by Orlando homebuyers in February was 3.75 percent, down from 3.93 in January. ORLANDO —There is an upcoming referendum in the United Kingdom, here is the impact it could have on the Orlando housing market. In most instances, uncertainty is anything but a friend to the real estate market. But for residents of the United Kingdom, a growing degree of uncertainty leading up to June 23 holds out the potential to make the real estate market seem considerably more attractive – although not in their native country, but in the U.S. An upcoming vote on the future of the United Kingdom’s role in the struggling European Union has already had an impact on the local real estate market – while at the same time, making an investment in the American housing market not only looks more attractive, but financially safer. An Flamand, the owner and broker at An Flamand-Orlando Vacation Realty, noted that this situation has created uncertainty in the EU — and uncertainty in the second home market. The real estate brokerage based in Orlando, Florida understands the international market and the reasons why so many European buyers are now looking across the ocean to the U.S. when it comes to purchasing a second home. In contrast to all the political uncertainty happening in Europe, Flamand noted, the U.S. – and Central Florida in particular – offers an oasis of strong investment opportunities.